Recently Ben has been working in the evenings, leaving just Maxwell and I at home for dinner. I am always looking for quick and easy meals to make us which Ben can warm up and eat later on if he needs to. As a family we do not enjoy microwave meals, frozen food and snack meals. I love to cook fresh and I love to cook our family a variety of meals that are healthy, hot and nutritious. 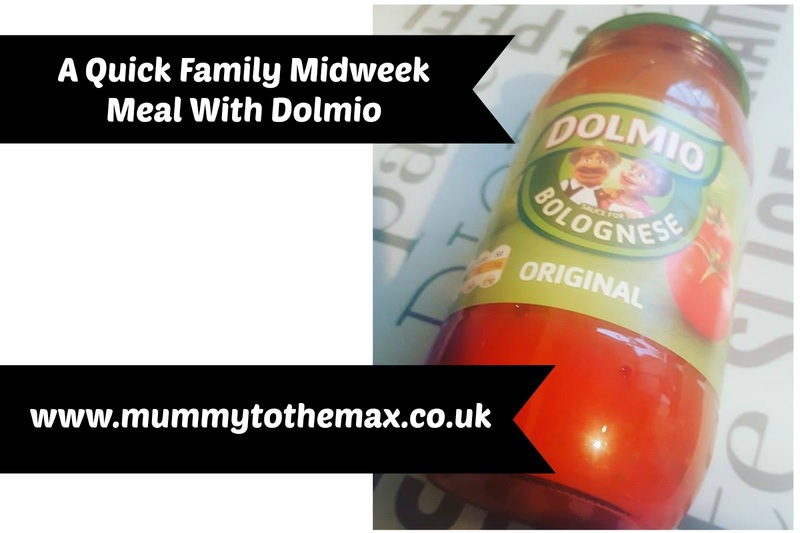 Recently Dolmio came to our meal time rescue when they sent us a package to create a delicious selection of meals using their jars of Dolmio sauce. For those that are unaware of Dolmio, a Dolmio bolognese sauce is now a staple which we always have in our cupboards. 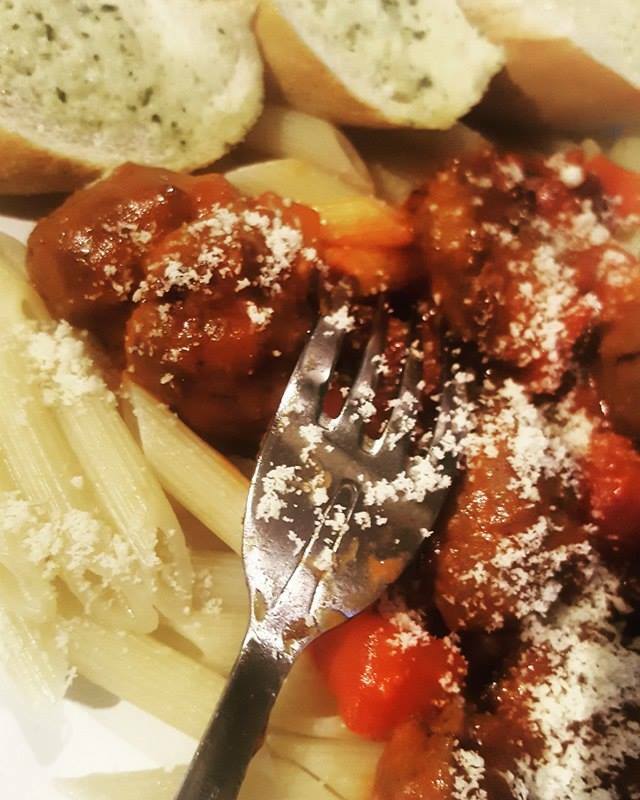 As a family, we love a quick and easy meal of meatballs, pasta and we often enjoy eating garlic bread. We love to top our meal with Dolmio sauce. 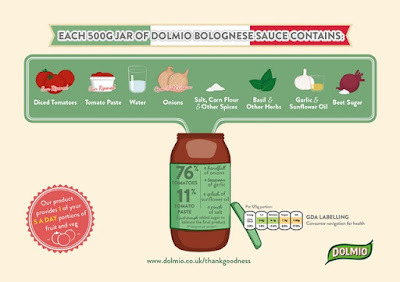 Did you know a 500g jar of Dolmio bolognese contains 10 juicy tomatoes, tomato puree, half an onion, a tablespoon of sunflower oil, some cloves of garlic, a handful of herbs, a teaspoon of corn flour, a teaspoon of salt, a pinch of pepper, two teaspoons of beet sugar, squeeze of lemon and a splash of water? There is nothing hidden in a jar of Dolmio and the jar actually provides 1 of your 5 a day. On the night I created our dish using Dolmio, I knew I would not be spending hours in the kitchen. I created our meatball dish in under 30 mins which was fantastic. I added pasta to a pan and allowed the pasta to boil, I created meatballs using mince, garlic, egg and onion and allowed them to brown off in a pan and I then chopped some additional veg into the dish to not only bulk the meal out but to add some more 5 a day's into our meal. It was then time to dip the sauce in and allow it to simmer over a low heat. Once the dish was ready to be served, I added some cheese to the top of the dish, I then decided to add some garlic bread on the side of our meal for all our family to enjoy! 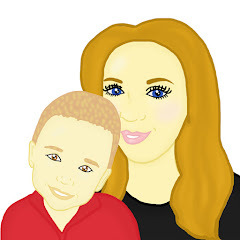 I created a quick and easy meal which is suitable for all of our family and a meal which can be warmed up later on when Ben arrives home after a 10 hour shift at work. Often, when I create a bolognaise with Dolmio sauce, I freeze any remaining leftovers and then defrost the meal and add it to a jacket potato in the week when Max is at school for lunch. Dolmio makes mealtimes easier for me and my family and is a fuss free, tasty ingredient to add to many meals.